One of my very favorite bloggers, Diane Campbell Payne at Capadia Design, issued a challenge to her readers recently. Diane describes what I often experience, and that is, finding inspiration for our crafting in many places. As she's rearranging her craft room (incorporating new Ikea finds! 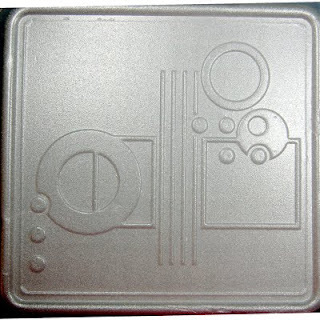 ), she came across an old styrofoam take-out box, pictured here. Her challenge? 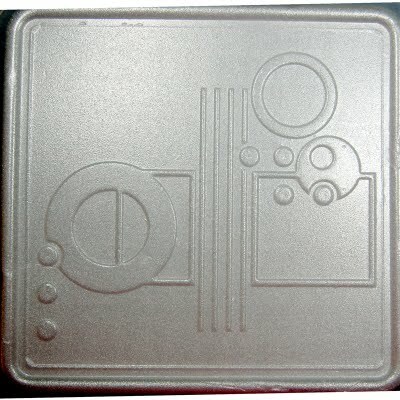 Create a project using this lid as inspiration, and linking back to her blog. And since one of my goals is to participate in more challenges to stretch my imagination, I played along. This is my entry. I created a 12x12" layout for granddaughter Charlotte's scrapbook. Staying as true as I could to the challenge "sketch," I sized two of Cheezer's tub-time photos and used a rubber-ducky paper background. (It's from my stash, I'm not sure of the manufacturer.) For the water droplets paper, I used scrap from my American Crafts' "Everyday" collection. I used rubber duck, bubbles and the sentiment fussy cut from a paper I got in a Facebook swap with Jennifer Lepard (thank you, Jennifer), along with stickers received from Jen too. I gave a little dimension to some of the cut-outs with foam tape, and glossed up the bubbles using Ranger's Glossy Accents plus Stickles to highlight the sentiment. What do you think? Did I rise to the challenge? Holy cow, what an adorable LO...you certinly did rise to the challange. Love it. What a sweet layout! I love the soft colors of your patterned paper! Thanks for joining us this week at Papercraft Star! First, I have to say, what an adorable baby! I love the expression in her photo on the right side. I also think you were clever to find a photo that would work with the circle placed on top on the left side. Cute papers to go with a cute baby! Thanks for playing along! You did a lovely job on Diane's take out sketch.